Have you ever asked yourself that question? When it comes to building your business, have you ever felt like you needed someone to point you in the right direction? Someone to get you on the path to doing great things? That’d be wonderful wouldn’t it? To have a guide. A compass. Something or someone who whispers in your ear the next step you should take to get you from where you are to where you want to go. Building a business is a lot of work. 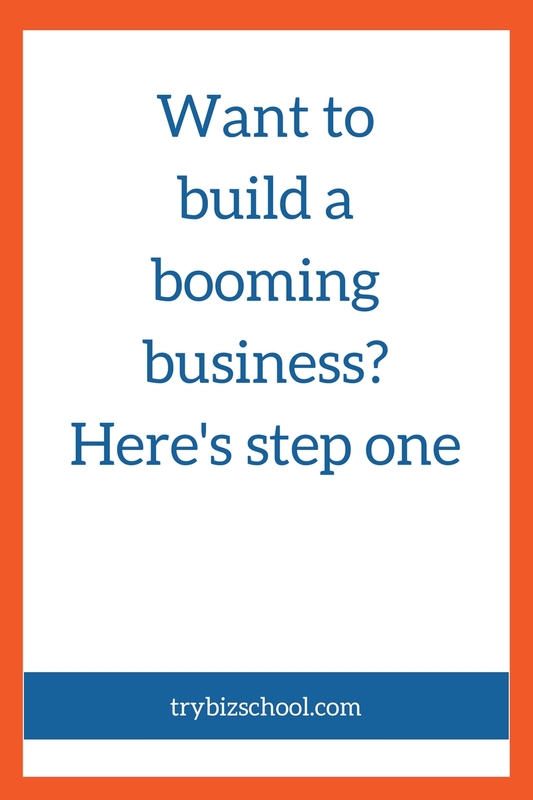 Figuring out how to build a business that thrives is even more work. It seems there are endless moving parts that all need to work together. And at the right times. All so your business can run like the well oiled machine you’d like it to be. The good news is you can have a guide. And it will absolutely be there to lead you along every step of your journey. But it requires you to take the right first step. No matter how far along you are in your business, investing time to get this step right is essential. “I just want to do God’s will. And He’s allowed me to go up the mountain. And I’ve looked over. And I’ve seen the Promised Land.” – Martin Luther King, Jr.
Michael Phelps sat in an office with his mother, his agent, and his long-time swim coach Bill Bowman. It was two years before the Beijing Olympics. They were talking about expectations and how he wanted to pursue the upcoming games. That’s when Phelps made his intention clear. Two years later, Michael Phelps won six medals to become the most decorated Olympian of All-time. If you judge by medal count, with twenty-two he is the best-Olympian ever. Michael Phelps declared his Promised Land. Then he worked with his coach to climb the mountain that would take him there. If you want to build a business that thrives, the first thing you need to do is define what success looks like. You have to declare what your Promised Land is. Only then can you figure out which mountain to climb to get you there. The notion of visualizing what you want to do before moving forward isn’t new. Stephen Covey covered it in The 7 Habits of Highly Effective People. He refers to the concept as beginning with the end in mind. When you know what your destination is, it does matter which way you take. It does matter which mountain you climb. And when you follow the path that leads to your business’ promised land, there’s a whole lot less wandering around. In business, your Promised Land is also known as your mission or purpose. But many entrepreneurs skip the step of defining their purpose. Others do it half-heartedly, without giving it the proper thought this exercise requires. According to Peter Drucker, the father of modern-day-business management, skipping this step can actually doom your business. And there will be plenty of cold mornings. Your mission will get you out of bed. It will point you in the right direction. And it will keep you from wandering away from the path to your Promised Land. But you’ll only get these benefits, if you adequately define what your purpose is. A lot of times when entrepreneurs try to define what their business is, they go about it all wrong. That’s because, they define their business goals around what they want. I want to be location neutral. I want to share my gifts with the world. While those are all great goals, they are personal goals. You should totally write them down as you’re designing what the good life looks like for you. But personal goals aren’t why your business exists. In fact, your business’ reason for being isn’t about you at all. In other words, your customer is the center of your universe. Since your customer is the focal point of your business, what you do for her is the key to getting to your promised land. So you’ve got to have intimate knowledge of who your customer is. You’ve got to know what her dreams, desires, fears, and frustrations are. To help you with figuring all that out, here are three exercises to work through. (In the coming weeks, we’ll explore each of these more in depth). Who is the ideal person your business will serve? The more descriptive you are as you define this, the easier your efforts will be moving forward. Think more of people who have a similar desire, burning pain, or unifying characteristic. Grab a sheet of paper, and write the down the unifying mindset or circumstance of your ideal customer. What challenge does your ideal customer want to solve when she is buying your product? When a person makes a purchase, they’re either buying good feelings or a solution to a problem. So you’ve got to define the problem the way your customer thinks about it. Grab that sheet of paper again. How does your customer think about her problem? Write it down. In building your business, you’ve got a blank sheet of paper. But the challenge that comes with having a blank sheet of paper is focusing enough to not try to do everything with it. So when defining what your business is, you do it by focusing on how you’ll solve the problem your customer has. Now it’s your turn. How does your business solve the problem your ideal customer feels they have? Write it down on your paper. It’s time to get to your Promised Land. But to do that, you have to get on the right path. You’ve got to take the first step in the right direction. Your mission will tell you which projects to work on. It will tell you how to spend your limited resources. It will get the right people on your team. Your mission will be your guide. But only if you invest the time to create a purpose so clear that it leads you up the right mountain. And to your Promised Land. Thank you for that reminder Sonia, that is some impressive writing. Annamarie – sometimes we do need reminders of the important things. Great post! a good reminder to keep retooling and refining – Just pulled out Covey for a re-read. Thanks Gloria! Yeah – I pulled out my copy of 7 Habits again for this post – and man, I forgot how much great stuff is in that book! And yeah – it’s important to always stay in a state of continuous improvement. Great post and reminder here, Sonia. I think we all need a reminder like this sometimes. Sometimes, it takes a while to get to the right path. But once you’re on it, and you have set guidelines to follow to make sure that you remain on that post, you can ultimately reach that promise land. I hope to get there sometime soon. All you have to do is keep going, and the promised land will be yours. Thanks so much for stopping by! Thanks Sonia. I have been wondering how to get my business off the planning table and you just did that for me. I want to start a Health and Wellness consultancy that will grow into a thriving business and I need your help and guidance please. Lawd, Lawdy-Lawd! Sonia, you facilitator of entrepreneurial blossoming! As usual, I don’t know where to begin. As usual, the first thing I’ll do is catch my breath. “All those moving parts” of a business or an event or.., I often call “ingredients”. When they come together, I call them “agreedients”. Promised Land–My home is full of items to remind me of my goals, aspirations & intentions. Visual & artistic affirmations I call, “Promised Landmarks”. I grew to drooling on the TV screen when “Lifestyles of the Rich & Famous” came on. My priorities have changed. My personal definition of success was transformed when I saw Les Brown doing a program on PBS. I decided, I’ll know I’m a success when I may contribute my talents to a cause as noble as PBS. I’ve enjoyed many a “success” en route, along the same glorious Path. I’ve written & recited poetry for fund-raisers, non-profits, worthy-causes, honor of people of merit. I’d still love to be hugely wealthy from products & services of my creation but I don’t need a Rolex sun dial for my yard. Mt Dwe`O’Pa–Sonia, I know you climbed Table Mountain in Cape Town, South Africa. Mt Dwe`O’Pa is what I made of my name Dwayne O’neill Parish. It’s where I go on meditation-journeys. And finally, say what you want about Miley Cyrus. I love her song, “The Climb”. I’m gonna go out & do some yard work while meditating on my enterprise. (What do I want to do? Who do I want to serve? What have at my disposal now, on this day to get me started?) I’m reminded of the Pakistani saying, “Blossom where you are planted”. y’all ain’t seen nuffin’. I spoke earlier of “agreedients”. I feel like I’ve found some fertile soil. Temps & conditions are jammin’ & the moment just seems right. Perhaps every moment has, but I hadn’t noticed. As many have said before, “Clarity is power.” – and that’s the case whether we’re defining our customers, their needs or just trying to solve a personal problem. We’ll written and something anyone should read who is about to start a new business venture! Hey King – yes! Clarity is power. And it’s important to have in so many aspects of our business, and in our lives. Glad you enjoyed the post – thanks for stopping by! I once heard, “Confusion is the last stop before clarity”. Dug! Confusion just means I’m processing the material. Activating the inner-computer to analyze & organize this for me. But what if I miss my exit? D’oh!